Below are a few items that a microscopist would do well to have on hand. They are by no means required but seeing them here can help one to find a suitable stand-in when situations merit. A representative image is provided followed immediately by a brief description. The list is a work in progress and will be added to as time permits. The graduated cylinder is an invaluable asset in measuring out quantities of liquid. Available in a number of sizes the microscopist will find it useful to have one (as seen on the left) graded in intervals of 1 ml. as well as one significantly larger, which will be convenient when mixing various dilutions of solvent, alcohol for instance. 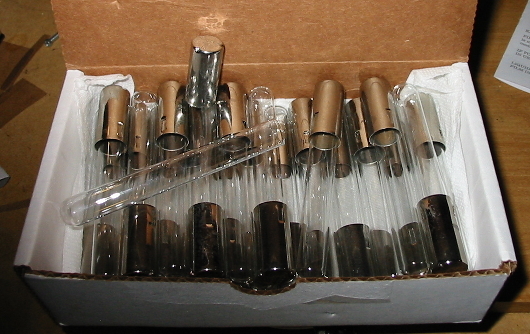 A supply of beakers resistant to thermal stress and in a variety of sizes will not go unused for long. A spouts for pouring facilitates easy decanting and rough graduations though not essential are a welcome convenience. Micrometers (using metric or imperial units) are invaluable in assessing the quality of cover slips. If one orders a quantity of No. 1 covers and measures them the nearest to ideal may be put aside for critical work. Cover slip gages are now very difficult to find in working order and do not appear to be manufactured any longer, so machinists micrometers must be used. 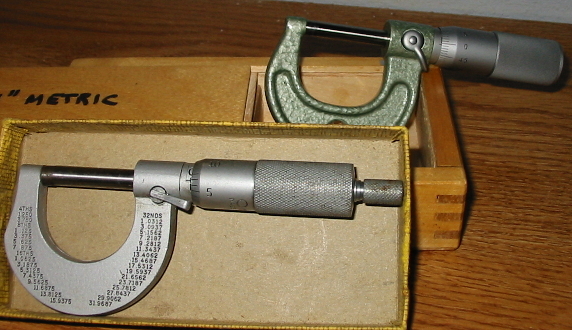 A set of gaged shims may be obtained of most places selling tools to ensure the micrometer is calibrated. Slide calipers can be helpful for much measuring that is required. The above example is digital and permits immediate conversion between metric and imperial units. This is especially helpful when working with antique American microscopes that deal with unfamiliar fractions of an inch. A balance will never sit idle. Some prefer the common and inexpensive digital scale but a balance will never suffer a dead battery. Obtain also a convenient weight of known mass for calibration whatever apparatus is acquired. 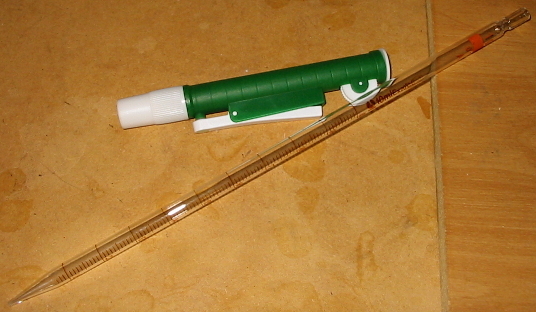 A pipette and pipette pump is very useful when small quantities of liquid must be added during solution preparation. They are available in many sizes with 10ml being perhaps the most versatile. In any laboratory a clean source of heat is frequently useful. When a gas line and Bunsen burner is impractical a spirit lamp will do nicely. 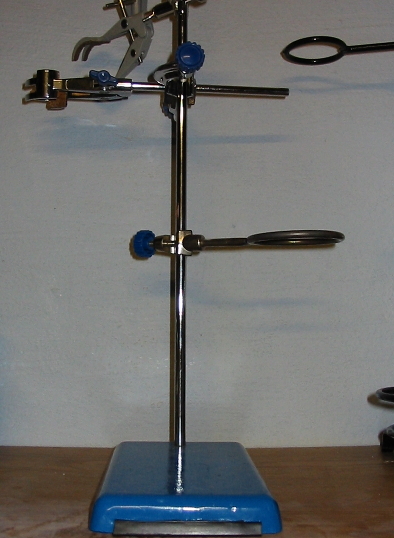 That seen on the left is the classic style known to owners of chemistry sets throughout the world, while the one on the right makes use of two narrow tubes punctured by small holes and filled with porous ceramic. It produces a hotter and more efficient flame than the traditional spirit lamp. Above either is a sturdy metal stand covered in wire gauze. 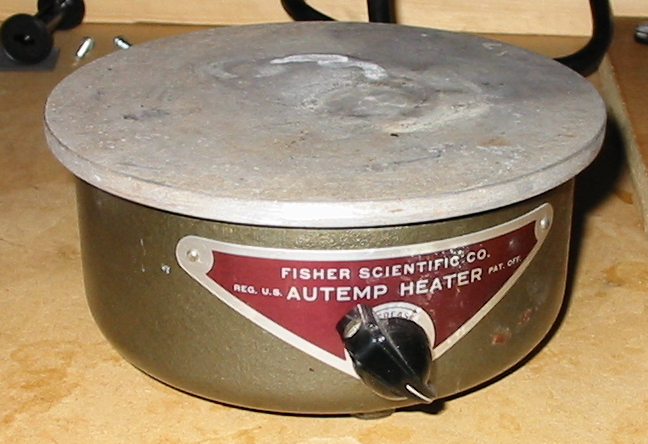 In a pinch a basic laboratory hot plate can serve as a heat source for nearly any need. This old work-horse has stood in for a warming table on many occasions. More advanced hot plates are available featuring thermostatically controlled temperature or magnetic stirrers. A laboratory hot plate is specially made to be used in the presence of inflammable fumes, do not use a camping or food service hot plate! 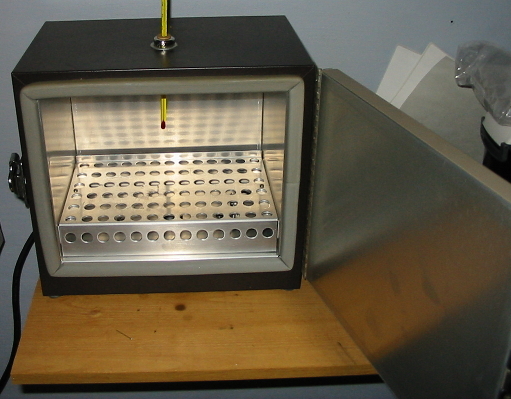 A laboratory incubator like this small 60watt unit is invaluable as a low temperature curing oven. It also works well for paraffin embedding and other temperature sensitive operations. This one has a standard thermometer port and dial temperature control. 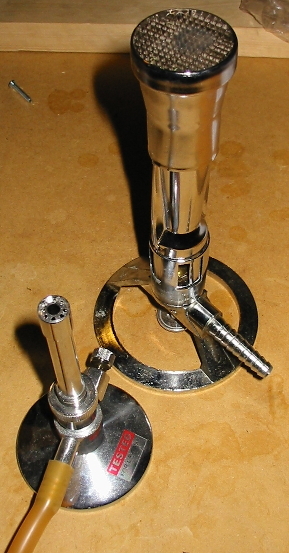 A Bunsen burner may be seen at left. This one has a needle valve for fuel control and a ring to control the air mixture, it has an internal valve sized for use with propane gas and produces a narrow roaring flame. At right is a large Meker-Fisher burner. It produces a much broader silent flame which is useful in certain bacteriological operations and has a similar air control and needle valve. Although this particular unit is sized for use with natural gas it still puts out a robust 10,500BTUs/hour with its 1.5 square inch heating surface, and a flame of well over 1,000 degrees centigrade. A selection of glass rods, solid and hollow, are often useful. Do not neglect to purchase a suitable carbide cutter, or triangular file. A supply of borosilicate test tubes, rubber stoppers, and a rack will be a welcome aid to any microscopist. Suitable for processing specimens or as collecting vessels be sure to get borosilicate glass as other types may fail disastrously when heated. A supply of watch glasses will provide an excellent work surface when one must perform operations on specimens in a small quantity of liquid. One can of course work on a slip in a drop of liquid but a watch glass keeps things from running off or drying out. Sufficiently large ones can be used to cover beakers or other glassware when necessary and the variety of sizes in which they are available is seemingly limitless. The Syracuse glass pictured above is much like a watch glass but its vertical sides help it to hold a greater volume. Additionally a small lip on the top edge is made to seat into a matching depression on the bottom so that numerous Syracuse glasses may be stacked. I favor the Syracuse glass over the watch glass for most purposes. Culture tubes are essentially test tubes that are so formed as to lend themselves to the growth of bacteria in solid or liquid media. They are apt to be shorter in length than most test tubes and have no lip. Culture tubes may be available without closure sealed with a cotton plug, or with plastic screw tops or plugs. Those shown above have friction-fit stainless steel Morton closures that allow for gas exchange. One can never seem to have to many forceps. Hemostats which can be locked in a closed position (seen at top) are wonderful for dissections and can serve as needle holders when a regular handle is not available. 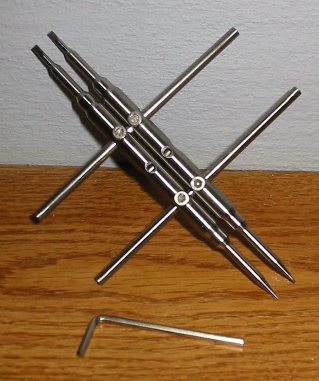 Blunt forceps which spring open (as seen second from the top and at the bottom) can be had at any drugstore and work well for manipulating larger microscopic objects. Those which spring closed (second from the bottom) may be had of most hobby shops and are similarly useful. An inexpensive dissecting kit can be had of many educational suppliers and will should at a minimum provide a pair of fine tipped forceps, a handle for holding replaceable needles, a small shears, and scalpel of one form or an other. Look for one that uses a standard Bard Parker (often called the B.P.) scalpel handle with easily replaceable blades and do not even consider one in which the implements are not composed of stainless steel. Section lifters as the one seen above may be had of implement suppliers or made from a wood handle a bit of thin metal. I prefer one which does not have drainage holes, and in a pinch a cover slip held in a forceps can do everything a section lifter can. Deftly wielded, a camel hair brush can do everything a section lifter can and more. Put one to use the next time a specimen must be cleaned of debris or separated for a larger group. Keep fine tipped ones inexpensive enough to be disposable on hand for spinning cells with a slide ringer turning a ring of varnish around a mount to give it that charming finished look of the Victorian microscope slide. Optical component wrenches are necessary not only for the disassembly of oculars and objectives but for servicing the focusing and inclination joints of most microscopes. In the US they are likely to be called spanner wrenches but do not be surprised if clerks look at you silly for that phrase in European countries. Get a large number of cheap sets and plan on grinding the screwdriver heads down to fit particular components. Wash bottles are available in a number of sizes and styles. I prefer those as pictured above, but versions with their spout protruding from the cap are also popular. Purchase them not larger than a standard beer can; an oversize wash bottle can not be brought so close to the subject of delicate work and is much more prone to accident. Some sort of tissue or lens paper will always find a task around the microscopists bench. Contrary to the name you wouldn’t want to wipe your oculars or objectives with lens paper, but cleaning up slides and drawing away liquids with a piece of disposable tissue will soon become an everyday occurrence. A dessicator is a handy way of storing chemicals and drying specimens that are to be mounted dry or stored for later processing. 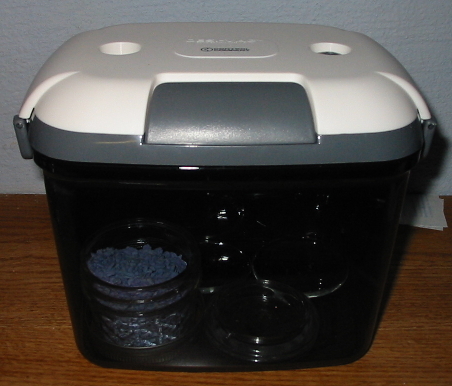 Above is an inexpensive modern vacuum desiccator. The blue substance is a desiccant and several specimens are present on the watch glasses. Traditional cookie-jar style desiccators are available but are often more expensive, although they permit higher levels of vacuum-they also require a separate vacuum pump-and will stand much harder use. A quality laboratory grease will seal effectively ground glass joints and prevent seizure. Traditional style desiccators are ineffective unless sealed with grease. If one is in the situation of needing laboratory grease do not use petroleum jelly as a cheap alternative, it is much to reactive and thin for our needs. A sturdy ring stand is a wonderful asset. Get one which has a stable and heavy base or a clamp for fixing the upright to the work table. 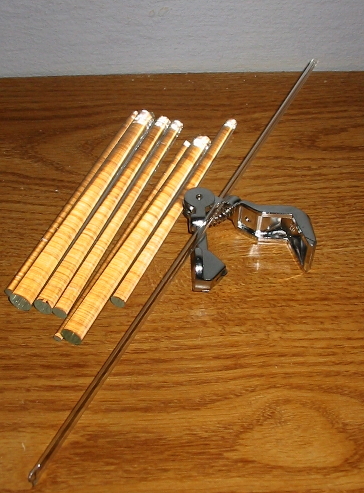 A selection of burette clamps, rings, and boss-heads will be useful as well. 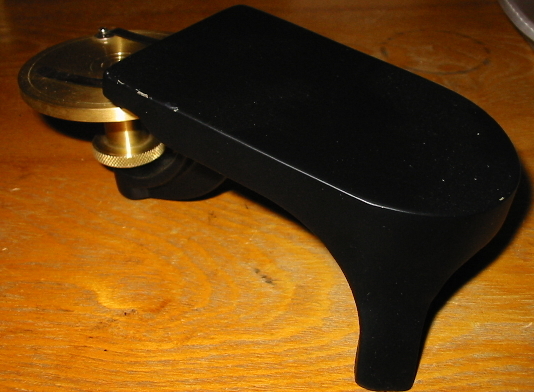 A slide ringing table, or turntable should be possessed of a heavy freely spinning slide carriage mounted upon a sturdy base. Many users prefer a model equipped with a rest for the users wrist and forearm. Used items come upon the market rarely, a few suppliers still sell modern versions.